The name of the Tanabata festival, short for Tanabatatsume, "weaving girl," was derived from an ancient Chinese legend about a Celestial Weaving Girl (the star Vega) who on the seventh day of the seventh month could cross the Milky Way to meet her lover. The day was first marked by Japanese aristocracy in the Nara period and in Edo the shogunate celebrated Tanabata as one the auspicious Five Festivals. In rural areas, the festival included prayers for a bounteous crop, and in urban areas, prayers for skill in calligraphy. Thus came about the practice of writing poems on slips of paper that were hung on bamboo branches as offerings to the two star-lovers. As seen, long green bamboo poles were tied to rooftop ladders and from these poles were hung slips of paper of many colors inscribed with poems. 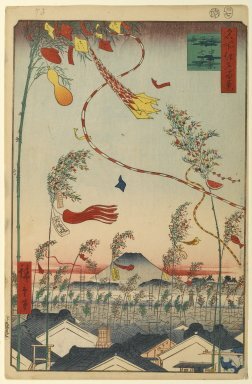 At the top is a cutout of a fishnet, an emblem of bounty, and next to it a sake cup and gourd flask (it is known that Hiroshige loved sake). Below, to the left, are merchant items: an abacus, an accounts ledger, and a money chest marked "one thousand gold ryo," and to the right are a string of ground-cherry fruits, a slice of watermelon, and a fish. An entry in the "Buko Nenpyo" notes that the bamboo poles were particularly numerous in 1873, the year that the official festival was abolished, to be replaced by the Western calendar and by the new imperial celebrations. This print is the first of the "Autumn" section of the series, and the snowless crest of Fuji suggests that it was quite warm. It is the only print in the entire series that does not indicate a specific place in the title, (the "shichu" in the title is "throughout the city"). However, this print is in fact a view from Hiroshige's own house in Nakabashi Kano Shinmichi, just east of the main Tokaido avenue; the place today is marked by a plaque. In the distance to the right is the fire tower marking the Yayosu barracks of the shogunal firefighters, where Hiroshige was born, raised, and lived until he was forty-three. The warehouses below belong to the merchants of Minami Denma-cho, just west of Hiroshige's house.